Notes: I was offered this book to review from the publisher. 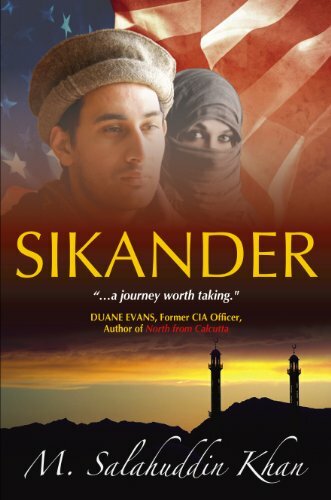 A brief summary: Sikander Khan, a Pakistani student turned mujahid after family turmoil in the mid-1980s, is the aptly named protagonist of Sikander. He returns to Pakistan after the fight, falls in love, and settles down to a normal life. Eventually his interest in English and the United States—from his years as a student—reemerge, and he finds himself journeying to America in a pre- and post-9/11 world. My thoughts: This book is well researched, and author Khan is quite good at explaining and weaving the political history of South and Central Asia into the plot. Even if you don't have a strong background in the history, politics, and religion of the area, you'll learn a lot. You'll also learn slang, religious terminology, and various phrases in Pashto, Urdu, and Arabic in this book. I really enjoy that, though I know it can be distracting for some readers, and I found Khan's glossary explanations thorough and sufficient. One area where I felt this book was seriously lacking was in Khan's dialogue. The descriptions are sparse and the dialogue common—which is somewhat unusual in the books I typically read—but the dialogue flops occasionally. The characters are flat, and many lack that aspect that make you feel connected to the book. I personally did not find any of the female characters to be particularly compelling either, though I'd be curious to read your thoughts on that. I think it's difficult to pick apart the book without veering into spoilers, but I would say that the second half of the book is much more interesting than the first. I think the plot is good, though long and drawn-out in a frustrating way at times, and that anyone interested in this area of the world will find it thought provoking. I'm excited to see modern fiction written by Muslim authors popping up in the post-9/11 era, so I think it's worth a read. I'm always interested in other cultures so this sounds interesting!